Through a magical combination of kindness, professionalism, and quiet persistence Joan Kramer and David Heely produced documentaries that captured the last echoes of the golden days of Hollywood. As they did they encountered some of the greatest actors, directors, and studio executives in the business. 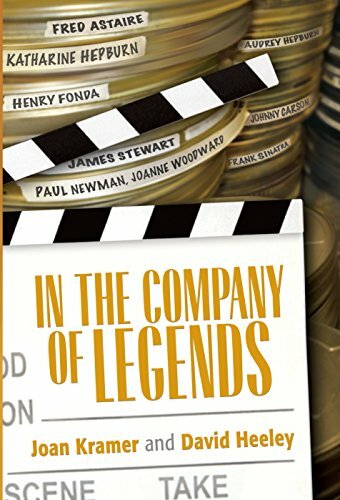 In the Company of Legends tells the story of how the two authors managed to create histories of some of film history’s giants. Stories of encounters with Katherine Hepburn, Henry Fonda, Paul Newman, Joanne Woodward, Spencer Tracy, Johnny Carson, Ginger Rogers, Peter O’Toole, Jane Fonda, Fred Astaire, and many others are found on each and every page. When they started on their long career as documentarians back in 1978, stars such as Hepburn, Astaire, or Stewart simply didn’t to allow visitors into their lives, and they certainly didn’t allow fellow film makers into their living rooms. Kramer and Heeley not only convinced these reluctant stars and artists to open their doors, but they also formed friendships with many of them that lasted a lifetime. Kramer and Heeley take turns detailing the step-by-step process needed to create such memorable programs as Fred Astaire: Puttin’ on His Top Hat, Starring Katherine Hepburn, James Stewart: A Wonderful Life, Fonda on Fonda, The Universal Story, and many others. The pair’s tenacity and ability to navigate the egos and paperwork, the details and lawyers, the studio heads and the National Archives is a lesson in investigative journalism as well as professionalism. There are hundreds of small stories that went into making their programs. Each one is fascinating for a multitude of reasons. While society, the studios, the media, and their own natural drive may have elevated Hepburn, Fonda, and Lauren Bacall to the heights of fame and success, the stories that Kramer and Heeley tell make human. These priceless insights also show business anecdotes. As unlikely as it seems, Hepburn and Michael Jackson were friends. He came to visit Jane Fonda while she and Katherine were filming On Golden Pond. Without giving much away the two become unlikely friends. Kramer and Heeley go on to relate a story so silly, absurd, and true that neither Sartre nor Beckett could have written that if they had lived to be 100. Several celebrities display an honest concern that their own presence as a host or narrator in the documentary might detract from the main focus of the program. Audrey Hepburn kills a paragraph because she believes that what she is reading may even come close to sounding like she considers herself greater than Fred Astaire. When a documentary about Jimmy Stewart is submitted for Emmy consideration, narrator Johnny Carson asks that his name not be submitted because “I don’t think it is appropriate. It is Jimmy’s show.” Bothe incidents are quiet episodes of humility and self-awareness that no one but Kramer and Heeley could relate so honestly. They also cover the modern era easily. Steven Spielberg’s memories of filming Schindler’s List are extraordinary. Not surprisingly, they also rate Spielberg as one of their best interviews ever. He is a student of film and can talk about it with a precision that others can’t touch. Richard Dreyfuss (who also provides the introduction) is a complete student of film. Hearing what the authors say about their encounters with him you understand that the man’s knowledgeable and detailed study of film history, acting techniques, and the craft of film itself was part of the reason he rose to the top of his profession. The book is a study in the politics of human interaction. There are frustrating encounters with Bette Davis as well as Harvey Keitel. Confronted with the blustering and occasionally contradictory demands of Lauren Bacall, the authors realize that these are mask for her own nervous nature. Once the actor finds this insight on her own the documentary on her late husband Humphrey Bogart moves forward with ease. The insight that she, often thought to be a rich widow, is just as concerned with making a living as anyone else only makes you love the actor more. Tucked inside the story of how they brought a documentary about actor John Garfield to the screen is a wonderfully touching episode. It also shows how the best quality that a producer or director can have is the ability to listen. The documentary was to be narrated by his daughter Julie Garfield, a respected actor and acting teacher in her own career. In early conversations about the film Garfield relates the story of how she didn’t see her mother cry once during her father’s funeral. Later that night, sneaking downstairs the young child saw her mother in tears as a friend held her. On the television a news program was showing film of Garfield’s funeral. From this heartbreaking story Heeley realized that film of the man’s funeral existed. The steps they took to find that film are a lesson in how to create a nearly perfect documentary that brings someone from the edges of Hollywood success to the spotlight they deserve. In the Company of Legends is written by two people who actually knew the people they talk about. In a town known for shallowness, Kramer and Heeley find heart and warmth and use that to create their own art. In an age where so much in the media is driven by misplaced cynicism and self-promoting delusions masquerading as insights or irony, their story is a breath of fresh air. A written documentary about film documentaries, this is perfect for anyone who loves film, Turner Classic Movies, PBS, or show business.